Cul de Sac - "ECIM"
With the last copies of ECIM being sold out a few years back, Cul de Sac's brilliant debut album has been unavailable until now. Thankfully, Strange Attractors Audio House, the label that has released most of Cul de Sac's more recent albums, acquired the rights to ECIM, rescuing it from "lost classic" status and making it available again for new and old fans of the band alike. 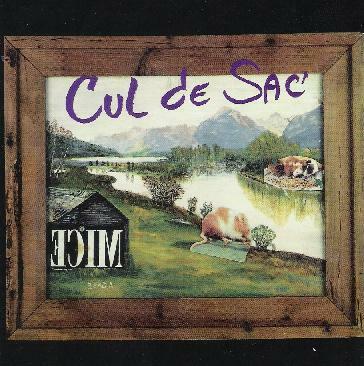 Originally released in 1992, ECIM found Cul de Sac with an already well-developed sound. This came no doubt in part from the rich experiences the two members of the band who have remained with the group throughout its history, Glenn Jones, who brought his love of traditional and exotic forms of music, a healthy interest in Krautrock, and his innovative string styles to the fold, and Robin Amos, who brought an edgy punk attitude and a predilection for wild, electronic experimentation. Joined in the early days by bassist Chris Fujiwara and drummer Chris Guttmacher, the band was exploring a neo-Krautrock, post-rock, instrumental jam whatever you want to call it style long before it was made popular by a host of other bands that followed. ECIM is vintage Cul de Sac. Kosmische musik style freakouts like Death Kit Train and Homunculus bristle with raw energy, fitting in perfectly alongside the folksy, yet kind of industrial jam of The Portland Cement Factory at Monolith, California (an intriguing cover of a song by later collaborator John Fahey) and the violin rich, Middle Eastern influenced The Moon Scolds the Morning Star. Fans of more recent Cul de Sac albums who haven't heard this one yet may be surprised to hear the far more prevalent vocals that appear on this album, but for the most part, with the exception of Song to the Siren, they come in the form of crazy mumblings and howls, similar to the style of classic Can or early Amon Düül. Presaging later sonic developments like those heard on the album Death of the Sun the band also makes clever use of voice samples, like Nico's sultry voice, which is heard on the song Nico's Dream. The Strange Attractors re-issue also contains three bonus tracks, recorded, as Glenn Jones mentions in his extensive liner notes, about a year after the original ECIM sessions. Cul De Sade is a raunchy, rough around the edges instrumental rocker with a definite punk influence. The Bee Who Would Not Work is much more spacey and mellower, looking towards later albums such as China Gate and Crashes to Light, Minutes to Its Fall. And the brief space noodle Negligee ends the album on a somewhat humorous note. ECIM is the sound of a band stretching its wings for the first time, and it's full of passion, enthusiasm, eclectic experimentalism, and terrific playing from all the members. If ever there was an album deserving to be re-discovered, this is it. And thanks to good folks at Strange Attractors, it finally has its chance. Hear Cul de Sac at: http://www.myspace.com/culdesactheband.